Read The Secret Trade Memo Calling For More Fracking and Offshore Drilling. The study on climate impacts shows that shale gas produced in the EU causes more GHG emissions than conventional natural gas produced in the EU, but – if well managed – less than imported gas from outside the EU, be it via pipeline or by LNG due to the impacts on emissions from long-distance gas transport. Health and Environment Alliance (HEAL), the Brussels-based not-for-profit advocacy group. Extracting shale gas, which can pollute groundwater and be environmentally damaging, represents a major new threat for public health in Europe, according to the Health and Environment Alliance (HEAL), the Brussels-based not-for-profit advocacy group. Francois Veillerette, President of Generations Futures, a HEAL member, will tell the meeting about the findings of his new book, “Le vrai scandale des Gaz de Schiste” (The Real Scandal of Shale Gas in Europe). 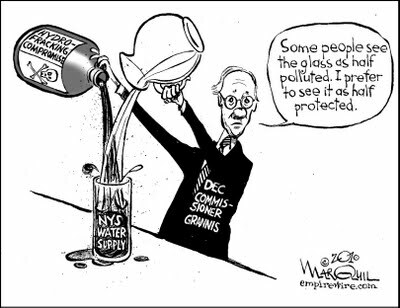 (4) He says that following ten years of widespread fracking in the USA, concerns can be summed up as “the use of dangerous chemical substances, contamination of groundwater, consumption of a large amount of water, and destruction of the landscape.” A study cited in the book shows that this mining process produces the same level of emissions of greenhouse gases as the use of coal. Generations Futures and HEAL want to see urgent action taken. “”We now need a clear European ban on the exploitation of shale gas, oil and other source rock hydrocarbons,” Mr. Veillerette says. 5. Two hearings in the European Parliament are planned during week beginning Monday 3 October 2011. ENVI hearing on the Parliamentary study on the impacts of shale gas on the environment and human health (Tuesday, 4 October, Item 16, ENVI/7/06759 (PE464.425)) and ITRE hearing on the prospects for shale gas in the EU (afternoon, Wednesday 5 October). 10. Sandra Steingraber, The Heinz Award and What I plan to do with it, http://www.orionmagazine.org/index.php/newsfrom187/entry/6467. Her new book, Raising Elijah includes a whole chapter on fracking, http://steingraber.com. potential industrial activities of this kind, and thus should be lowered substantially. focus on fracturing activities and their possible impacts on surface water. should be mandatory in finding these decisions. 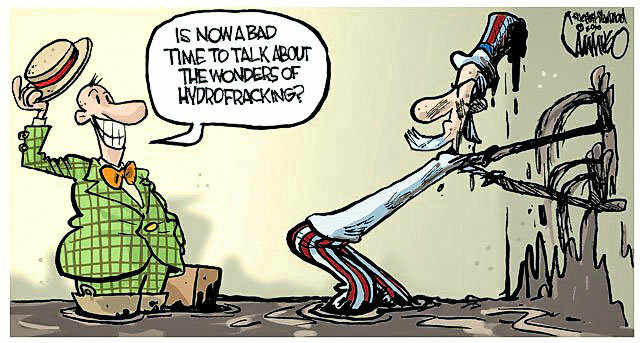 European Union report says ban fracking | Scoop News. “It is ironic that the Petroleum Exploration and Production Association (PEPANZ) issued a position paper glorifying fracking as the saviour of the world’s energy problems within hours of a European Union requested study that considers banning the practice outright across Europe” says Emily Bailey, a member of Climate Justice Taranaki. “While industry PR agents try to convince the public that the chemicals used in hydraulic fracturing are similar to many found in other commercial uses or in the household, they fail to mention that a recent Taranaki Regional Council report stated the use of highly toxic chemicals including Xcide 102 – a biocide toxic to humans, domestic animals, fish and wildlife; Inflo-150 – a friction reducer containing methanol and ethylene glycol, both highly toxic, hazardous substances; and GBW-41L (Hydrogen peroxide) – an animal carcinogen harmful to humans even at low concentrations in vapour form. Environmental agencies in the US and elsewhere now admit these chemical cocktails have not been tested properly and even minute quantities can cause serious health impacts. Although the Hazardous Substance and New Organisms (HSNO) Act requires any hazardous substance manufactured or imported into NZ to have an approval from Environmental Risk Management Authority (ERMA), there is no requirement under the regulations for ERMA to be notified when the substance is being used.” says Bailey. 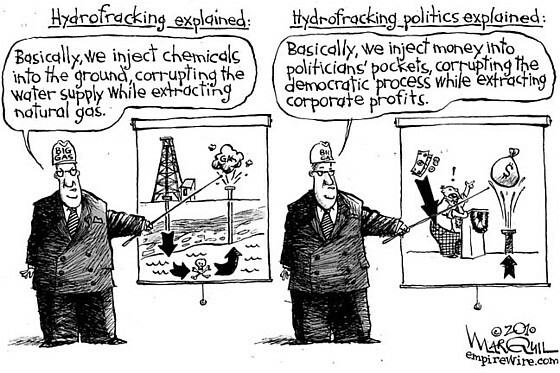 “The public doesn’t need industry spin when it comes to fracking. What we demand is that our government follow several US states and France’s lead and ban this dangerous extraction method. Meanwhile landowners can follow Australian farmers and ‘Lock the Gate’ while our communities continue being pro-active and finding solutions to reduce our use of fossil fuels” concludes Bailey.